At Sun City Gardens we offer assisted living and residential living. We have answered some frequently asked questions for each of our levels of care on this page. We recommend visiting between 7 am – 7 pm. After hours entry is available by checking in with night patrol at the entry gate. Senior residential living is a community designed for those over 62 that desire a worry-free lifestyle and social engagement. 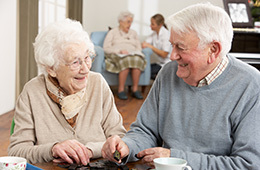 Assisted living is housing for those 60+ that provides assistance with activities of daily living. We offer housekeeping, laundry, and various other services to help each resident attain their highest potential level of independence. Is there any space available for private parties? Sun City Gardens has specific areas available for resident private parties. Please contact the leasing office if you would like to learn about leasing this space. Pets are permitted to visit, and we have specific areas for pets. If you would like a pet friendly apartment, please contact the leasing office for options. At Sun City Gardens we have a both a beauty shop that specializes in on-site haircuts, color, and perms for both women and men, as well as a nail salon that offers manicures and pedicures. Please inquire at the front office for more details. As a courtesy, Sun City Gardens offers complimentary 50 basic cable channels. Expanded cable TV packages and channels are available for purchase. Please see the front office for more details. We believe events and activities enrich our resident’s lives and have a powerful impact on one’s health. We create a fun, uplifting environment where our residents can be social, get involved, and enjoy their favorite hobbies and activities. All residents are provided with a monthly newsletter and calendar to keep them informed of upcoming activities. Copies of the newsletter and calendar can be obtained at the front desk. Click here to view our online newsletter and activities calendar. For the safety and health of our residents and staff, Sun City Gardens is a smoke-free community. We do, however, have designated smoking areas outdoors. Please inquire with the front desk to locate designated smoking areas. At Sun City Gardens we have a full-time business office manager. Our business office manager will answer any questions you may have regarding financial or billing concerns. To make an appointment with our business office manager, please contact the front desk. We provide weekly housekeeping. Our friendly and professional staff cleans each apartment every week. If alternative measures must be taken, please contact our front office. Our chef works to create flavorful and nutritious food, and we also accommodate special dietary needs for residents with a physician’s order.